Description: Astronote Plus Blogger Templates is a blogger template for personal site with clean & elegant design and much additional custom premium widget. 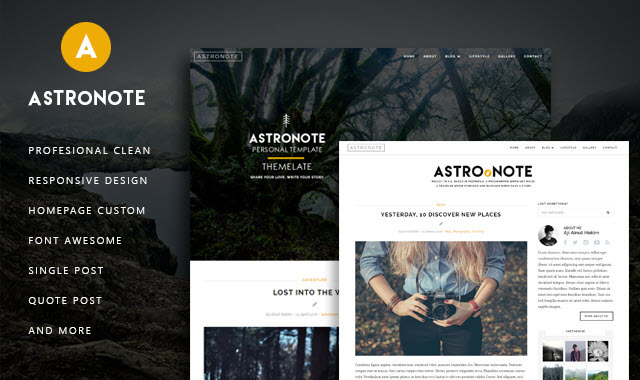 Astronote Template is intended for those of who want to build a personal site with an elegant and responsive design in all screen mode. This template also added some widget features that can customize as you wan and your personality. We provide a sample template that you can try and use for free. However, you will not get additional features like the plus version. This template guided with tutorial documentation to install and customize the template, even if you are new in blogger. We made a guide that is easy to understand for beginners, also a guide to learning use blogger.